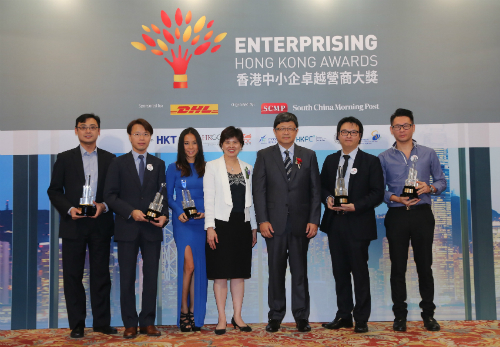 SCMP Group Ltd (SEHK: 583), Asia’s leading media holding company, yesterday named five outstanding small & medium-sized enterprises (SMEs) and entrepreneurs at the 2nd Enterprising Hong Kong Awards. 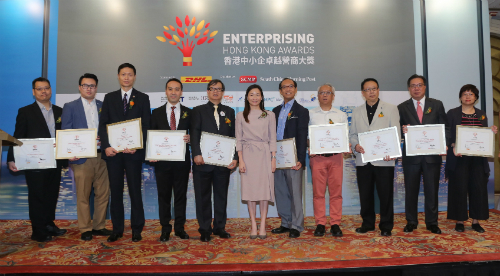 Organised by the SCMP Group and sponsored by DHL Express, the Awards recognise and celebrate SMEs and their leaders whose brilliance defines industry benchmarks. The winners were selected by an esteemed panel of judges from nominations recommended by a number of industry partners. At the Enterprising Hong Kong Awards 2015 presentation ceremony are (from left) Innovation Excellence Award winner – Infocast Limited, represented by its Director of Platform Strategy Mr Alex Cheung; Corporate Social Responsibility Award winner – Wessen Group Limited, represented by its Managing Director Dr Thomas Su; Brand Excellence Award winner – Anything But Salads, represented by its CEO & Co-founder Ms Calista Goh; Ms Ecila Chan, Vice President, Commercial, DHL Express Hong Kong; Mr Robin Hu, CEO of SCMP Group; Mr Derek Wu, Young Entrepreneur Award winner & CEO of Future Lighting Collection; and Export Excellence Award winner – Advance Bright Limited, represented by its Managing Director Mr Felix Chan. At the 2nd Enterprising Hong Kong Awards are representatives from industry partners (from left) Mr Gary Tong, Chairman of Hong Kong Young Entrepreneur Association; Mr Eugene Chan, National Business Director of Junior Chamber International Hong Kong; Mr Francis Lee, Vice Chairman of Hong Kong (SME) Economic and Trade Promotional Association; Dr Stephen Kwok, President of Hong Kong Small and Medium Enterprises Association; Dr Edward Lam, President of Hong Kong SME Development Federation; Ms Elsie Cheung, COO of the SCMP Group; Mr Jefferson Wat, President of SME Global Alliance Limited; Mr Charles Hui, Vice Chairman of Hong Kong Promotion Associations for Small and Medium Enterprises; Mr Jimmy Wan, Founding President of Hong Kong Greater China SME Alliance Association; Mr Peter Lam, President of the Hong Kong General Chamber of Small and Medium Business; and Ms Carol Hui, Vice President of Federation of International SME.